The team of our artists loves the Fallout universe very much, both the old and the new parts of this beautiful game. 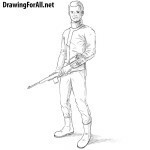 In previous drawing lessons we showed you how to draw the Vault Dweller and a ghoul. In this drawing lesson we will continue the theme of the post-apocalyptic universe of Fallout and show you how to draw a super mutant. Super mutant is essentially just a very mutated version of a human, and therefore we will apply the principles of drawing an ordinary man. First of all, we start to draw a head that looks like a regular oval. 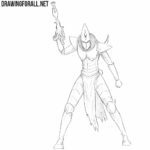 Next, draw a simple line of the spine and draw on it the chest and pelvis. 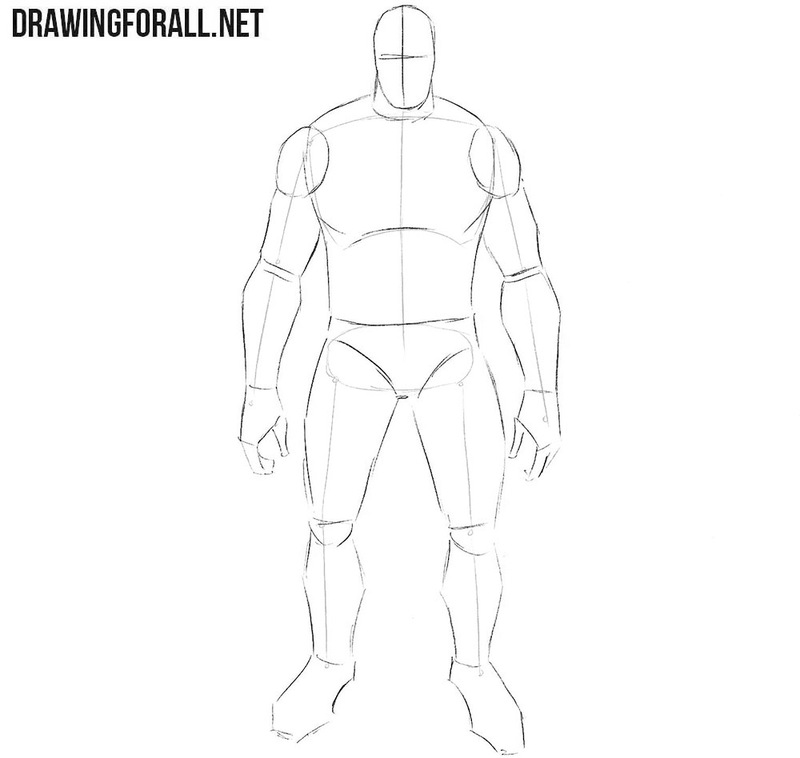 Using the simplest lines we outline the arms and legs. Now we add volume to the body of our super mutant. But before we do this, we sketch out two lines on the head. 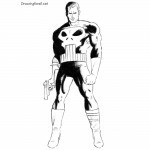 After that, we sketch out the outlines of the wide neck and massive torso. Next, sketch out the outlines of the arms and legs with simple geometric shapes (cylinders and balls). Now is the time to add some basic details. Let’s start with the head and move towards the feet. First of all, we outline the details of the face and large ears. 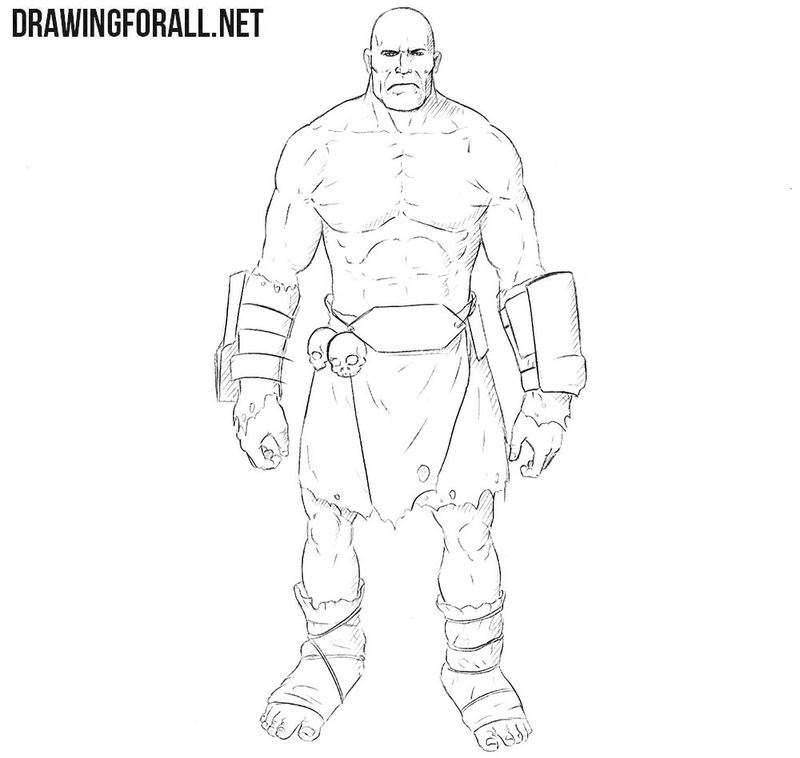 Next, we move below and sketch out large bracers, loincloth and huge boots. If you did everything right, then go to step number four. So now it is time to start drawing the final details. 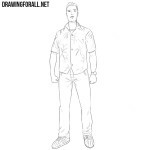 Using clear and dark lines, gently draw out the eyes, nose and mouth. Next, gently draw the outlines of the head and large ears. Draw wrinkles, as shown in our step and remove all unnecessary lines from the head. 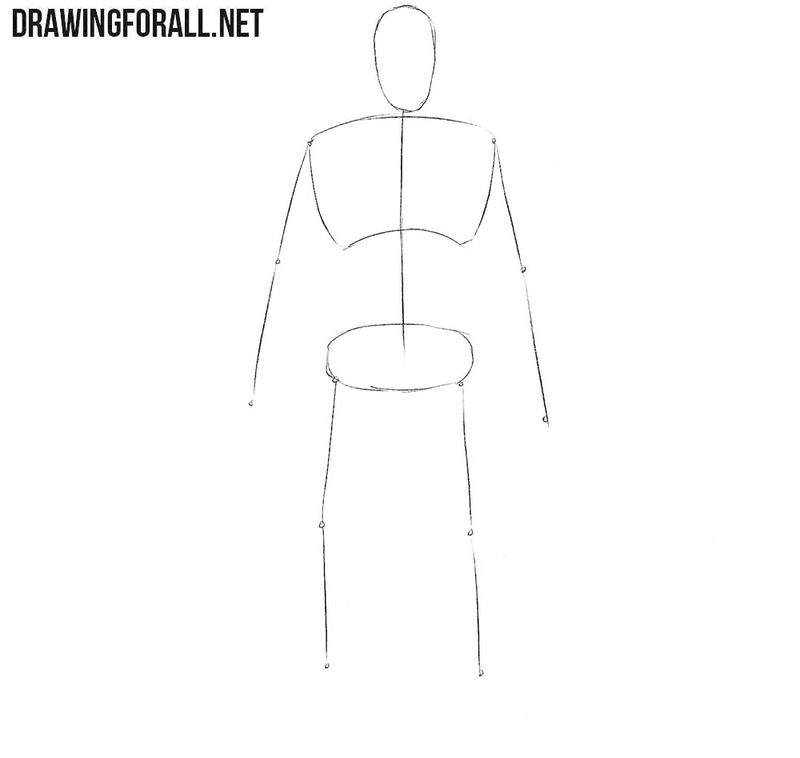 If the head is drawn and looks like the one in our example, then let’s proceed to the torso. First, gently draw the thick neck. 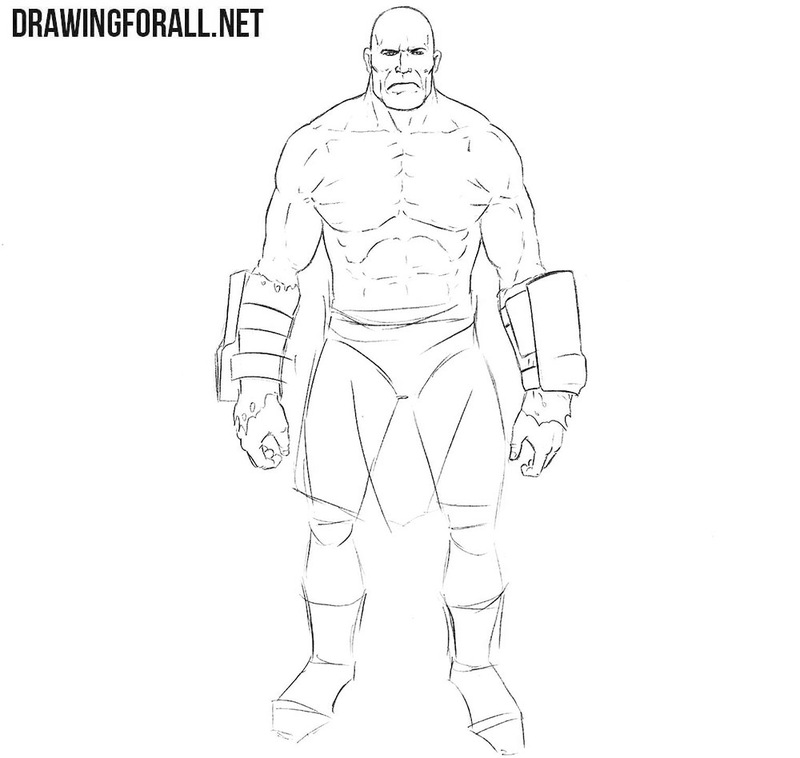 Next, draw the outlines of the torso and huge pectoral muscles. Below we draw the abbs and the folds of the skin. Remove all unnecessary guidelines and move to the next step. Now, continuing the torso lines, we carefully draw the outlines of the deltoids, which smoothly flow into the biceps and forearms. Be especially careful when drawing bracers and hands (for this, visit the lesson on how to draw hands). Remove all unnecessary guidelines from the arms and draw the necessary muscles and folds. Have you already drew the arms? If so, let’s draw the legs. 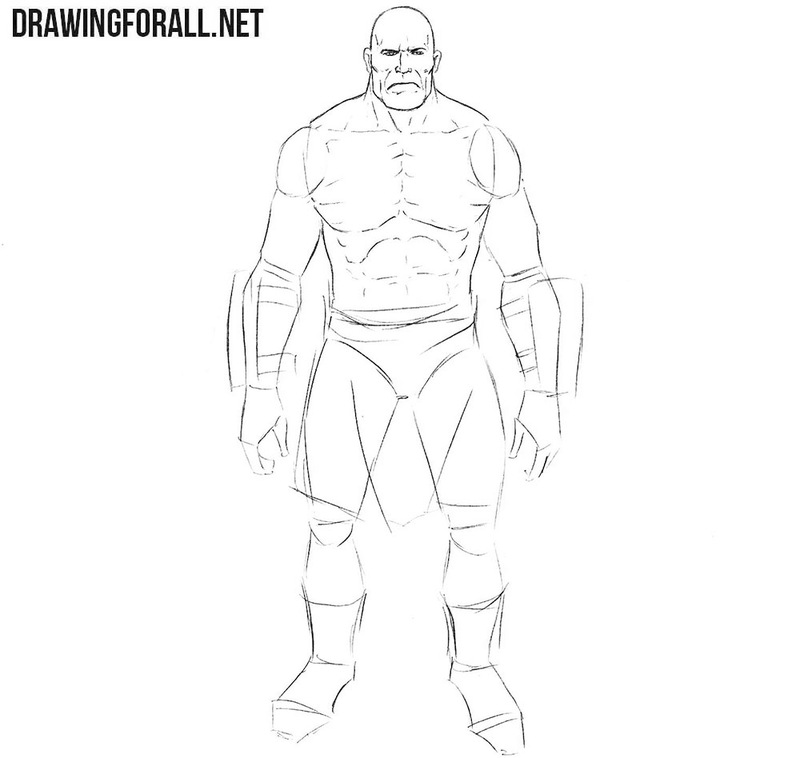 Continuing the lines of the torso, we carefully draw all the details of the loincloth. After that we draw the pumped up legs and knee joints. At the very end of the step, we need to draw shoes and remove any remaining unnecessary lines from the drawing. The drawing is almost complete, but our super mutant does not look very voluminous. In order to fix this situation, we will draw shadows. First we will determine the light source (which in our example is in the upper left corner) and then draw the shadows with the help of a dense hatching. If our lesson helped you learn how to draw a super mutant, then we are very happy. 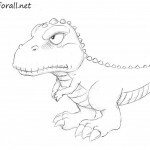 If you want to see any creatures or characters from Fallout, be sure to write us about it in the comments to this drawing tutorial or in our social networks.